Yes! Everybody poops, including the different breeds of dogs. The big question that we keep in mind is, why does my puppy poop so much? Let’s face the truth that our puppies are really pooping instruments. We are often surprised by the poop amount produced by our puppies. How many times do our puppies eliminate their waste? This is the first question that we need to face after bringing a puppy into our home. It actually depends on their size, health, and age. When you have young puppies at home, it is expected that they will poop immediately or after every 30 minutes once they eat their meal because they have a lack of control over their intestine. In this case, we need to watch our dog during his meal and once he is done, we need to take him out especially when you see the sign that he needs to eliminate his waste. But once you notice that your puppy hasn’t pooped for two days, there is a big chance that he is suffering from constipation. With this situation, it is best to consult a veterinarian immediately. Why Does My Puppy Poop So Much? We need to have a better understanding of why our puppies eliminate their waste from time to time. Here are the reasons why our dogs poop too often. We need to make sure that the amount of food that we will feed him is right and suited for his size, age, health condition as well as his lifestyle. Lessen the parts or chop the food for him and examined if his digestion improves. We need to be aware of the things that your dog can steal from our garbage can and kitchen. This can also be the reason why our puppies poop more. As much as possible, feed with the right food that he needs. The digestive system of your puppy can be very sensitive to any food, so if you are going to a new formula of food, his digestive system may react to some of that newness and he is going to eliminate it like other waste. Radical changes in his surroundings may trigger an increased need to eliminate. 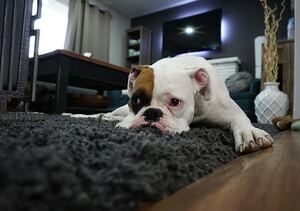 When you are moving to a new house or area, it could affect your dog’s bowel habits because it changes the parameters of his routine area. There are times that even new smell and new sound in his surroundings could trigger his poops until he can cope to the things around him. We need to be knowledgeable about the different type of medical issues our puppies can have. Too much poop can be a sign that your dog is suffering from illnesses. Some of the conditions are irritable bowel syndrome, colitis, the presence of internal parasites and other diseases affecting his health. Sometimes, there is a good reason behind why our dog’s poop so much and that is his growth. They are often fed than the adult dog. They are fed for about 3-6 times per day depending on his age. They have a high metabolism and they are growing which requires them to have a lot of energy. For that reason, they need to eat more often during the day which then results in more poops. Is it normal if our puppies poop too often? What Should You Do If Your Puppies Poop Too Much? If your puppy is pooping too often, the first thing that you should take into consideration is the place where your puppy poops. Normally, a trained puppy will eliminate his waste in an area where he is trained to do his business. But if he poops in an area beyond his “usual spot” there is something wrong with him. You should give extra time in inspecting his poop. If you find their waste in their unusual spot, there is a big chance that you’ll find a watery and loose poop. If this is the situation, there is a big chance that your puppy has diarrhea. If your dog is suffering from this case, you could take immediate solutions to correct it. It is advisable to schedule a visit with a veterinarian immediately. If there is a more serious case, then your dog’s veterinarian can go with a plan to help your puppy go on a faster recovery. We also need to keep in mind that if ever our puppy has no “usual comfort zone”, then it is another step that we should take into consideration to improve the consistency of his bowel movement habit. You just need to take your puppy to the same area every time until he recognizes that area as his own puppy bathroom. If you are one of the puppies owners that questioned themselves “why does my puppy poop so much” then you should take some time to examine and evaluate your dog. As mentioned above, there are reasons why they do. We, as a dog owner should know that poops convey important clues about your puppies health and it is very important to pay attention to the features and quantity of poops they eliminate.